The blue sky above our city is topped with a layer of jaundice-yellow tinged gray smoke from wildfires ravaging scrubby hills five miles from our home. 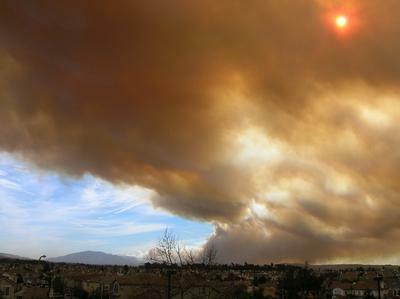 The air smells like burnt toast, and sooty ash smothers yards, roofs and car windshields. Local news says the fires, now burning for three days, are 22% contained. Most evacuees have returned to their generous suburban neighborhoods. But the legendary Santa Ana winds are blowing today, and the February 8, 2006 temperature hovers around 85 farenheit. We've had less than an inch of rain this winter, and spring starts next month. Life in the desert we call Southern California is vastly different from most of the US. It's about water, sunlight and fire, not snow, tornadoes and hurricanes. And it's about earthquakes.